DENVER – Cale Makar made an instant impact. 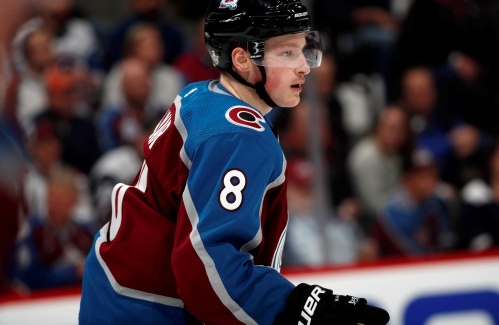 The Colorado Avalanche defenseman scored a playoff goal in his NHL debut during a 6-2 Game 3 victory against Calgary, his favorite childhood team. Makar zipped through the neutral zone Monday night, took a pass from Nathan MacKinnon and beat Flames goaltender Mike Smith with a wrist shot late in the first period to make it 3-0. The 20-year-old Makar signed a three-year deal with Colorado on Sunday – a day after his college season ended when UMass lost in the Frozen Four championship game to Minnesota Duluth. Makar, the fourth overall pick by Colorado in 2017, had 49 points for UMass and won the Hobey Baker Award as college hockey’s top player. He practiced Monday morning with the Avalanche for the first time. He made an immediate impression, too.